I found several recipes for this wonderful Cinnamon Roll Cake, so picked what I liked and combined to make this great cake. It is awesome to use for breakfast, some of the instructions said to swirl the cinnamon part in long rows, I decided to swirl it into little circles to make it look like individual cinnamon rolls and that also made it easy to know where to slice it. So here it is, do enjoy with a fresh cup of coffee. into this 1/2 c. melted butter. Pour this mix into a 9 x 13 baking pan that you have greased or buttered. ix it partly into the batter. You want it to look like cinnamon rolls at this point. Bake for 28-35 minutes at 350 degrees. 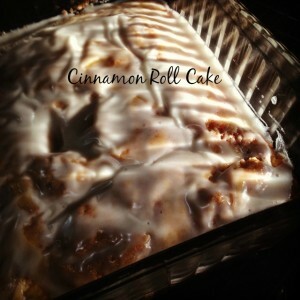 This entry was posted in From the kitchen, Recipes and tagged Cinnamon roll cake, cinnamon rolls, recipe for cinnamon roll cake by admin. Bookmark the permalink.